It would be very easy, given the front cover and the sound, to think this was an album released in the 1950s or 1960s. It definitely has a retro sound and the cover image is obviously meant to appear old fashioned. This outfit, though, is a product of the 21st Century. Their musical style so perfectly captures the past. The biggest selling point here is the vocal arrangement. These ladies (Eleni Mandell, Becky Stark, Inara George and Alex Lilly) blend their voices and do harmonies for one another so well that it’s almost scary. The funny thing is, musically this isn’t exactly the kind of music I like. Don’t get me wrong, it’s not something I dislike. It’s just not what I generally listen to often. The vocals make this work so well, though. It’s a great disc to put on and just enjoy. It would be a great addition to holiday celebrations. This is a short tune. It’s just piano and vocals at first. A horn plays after the first verse or so, though. The voices really work well. They are soaring and quite pretty. There’s a bouncy, near country vibe to the instrumental arrangement here. The lyric do contain a reference to winter time. There’s a slower, mellower section mid-track, but overall this is energetic. It’s also quite fun. It’s retro textured to the point of being quaint, but in the best way. Here we get a shuffling kind of arrangement that has a bit of honky tonk country element to it. This classic song works quite well with this sort of treatment. 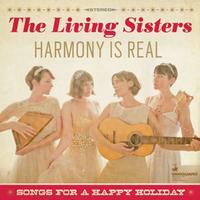 You’ll find yourself singing along, but with harmonies like this you sure aren’t needed. The instrumental section really brings home the down home country link. Piano starts this. The arrangement has a real jazz combo feeling to it. As always, the vocals are what make this particularly special. It does get into a rocking vibe as it continues. This is a fun song. Pop and rock merge on this arrangement. It feels both modern and retro. It’s catchy and has some great bass work. I like the horn section, too. Old time rock music with 1950s vocal group elements makes up the concept here. It reminds me more than a little of a female Beach Boys sound. It’s fun. Bouncy and fun, this has more of that old time rock and roll vibe. They turn it into a bit of burlesque sounding theatrical music as one recurring section. Then a retro guitar solo takes it back into the song proper. I’ve always loved this song, in all its various forms and formats. This is a fairly stripped back arrangement, but the vocal harmonies never let it feel bare. Mellow and vintage sounding, this has an arrangement that combines folk music, country and jazz. The vocal arrangement is very much pure folk music, though. This is a great tune. It’s got a real old time jazz vibe to it. The vocal arrangement is a lot of fun. The groove on this is so infectious. Another vintage sounding piece, this has a folk and old time pop music sound to it. The vocals really make it work. The harmonies are great. This has always been another of my favorite holiday tunes. I’m definitely not disappointed with this version. This piece is a perfect bookend to the opener as they have the same general musical arrangement. To me, this is less playful and more serious, though. It’s very pretty, and if anything the vocal harmonies work even better here.